Do You Want To Help Diminish Allergy Symptoms? Nearly 20% of Americans suffer from allergy symptoms, often caused by environmental triggers, called allergens. Common allergy symptoms include: Runny nose, Weepy eyes, Wheezing, Post nasal drip, and Dermatitis. If you suffer from allergy symptoms or asthma, Green Steam can help alleviate your symptoms. 1) What is indoor biological pollution? Some of these substances are in every home. It is impossible to get rid of them all! Even a spotless home may permit the growth of biological pollutants. Two conditions are essential to support biological growth nutrients and moisture. These conditions can be found in many locations, such as bathrooms, damp or flooded basements, wet appliances (such as humidifiers or air conditioners), carpets and furniture. Except for the spread of infections indoors, ALLERGIC REACTIONS may be the most common health problem with indoor air quality in homes. They are often connected with animal dander (mostly from cats and dogs), with house dust mites (microscopic animals living in household dust), and with pollen. Allergic reactions can range from mildly uncomfortable to life-threatening, as in a severe asthma attack. 3) How to control its growth and buildup. 1.) Have your carpets, furniture, and mattresses cleaned thoroughly and regularly by a trained professional. Green Steam Carpet Cleaners specialists recommends frequent light duty cleaning to minimize the effects of biological contamination, along with regular deep cleans several times over the course of the year. Green Steam Carpet Cleaners utilizes cleaning products that are chemical-free, and are safe for pets and children. Unlike our competition our products contain no soaps or detergents this minimizes unhealthy soil from occurring in your home, by not allowing it to stick to the carpets. By choosing to place your home on a regular cleaning schedule, you will get enhanced appearance, value, extended life from your furnishings, and significantly improved indoor air quality. Who doesn’t want better health overall. 2.) Install, Use and Clean regularly exhaust fans that are vented to the outdoors in kitchens, bathrooms and your utilities spaces. By installing exhaust fans into the kitchen and bathrooms, you can diminish the amount of moisture build-up within your home. High humidity and moisture can lead to mildew and mold growth. Don’t forget your dryers, either! These should always be vented to the outdoors, and checked occasionally for blockages. Not only are dries a fire hazard when they are clogged, but they will force the moist air back into the room as well as increase your energy bill. If you’ve experienced water damage, whether from a burst pipe, an overflowed bathtub, or a leaky roof, you must thoroughly dry and clean any materials impacted. Water-damaged carpets can harbor moisture, and even trap it against the flooring beneath. It is best for any major water-damage issues to contact a professional to help you resolve the issue within 24 hours, if possible. In some cases, you may need to consider removal or replacement of the damaged materials. Regular household cleaning can help to diminish, though not remove, the build-up of pollutants within your home. 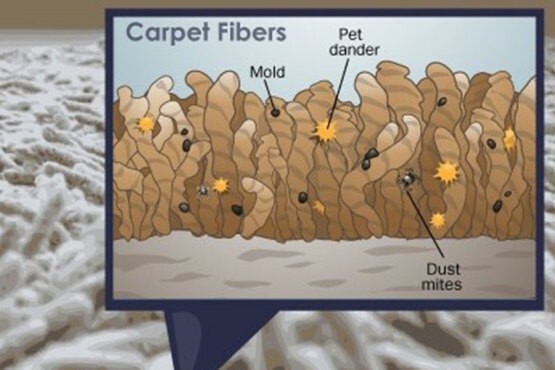 House dust mites, pollen, pet dander, and other allergy-causing contaminants build up in the dust that settles on your furniture, mattresses, bedding, drapery, air ducts and in your carpet. Regular cleaning can reduce that build-up.